The team of volunteers 2013 achieved a splendid project in Vikumgama village during their stay. 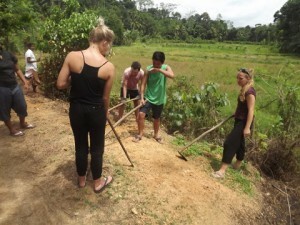 They worked alongside the villagers to prepare and develop small home gardens and agricultural plots. A huge amount of effort went in to acquiring the appropriate tools, digging out the plots and undertaking the first plantings of fruits and vegetables. The village residents have undertaken to ensure on-going maintenance and sustainability of this local development which should be of benefit to many families. Because of its success, a further garden was established for the community in Aththudawa and hopefully this scheme can be extended to other villages in the future.